CEO Belinda Guadarrama has received the Public Service Medal from NASA. It is the highest honor a civilian can earn from that agency. 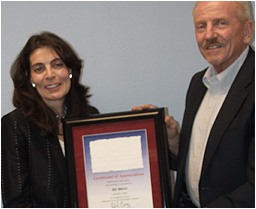 Here Belinda Guadarrama receives a certificate of appreciation from Astronaut Loren Shriver, commander of 3 space shuttle missions. 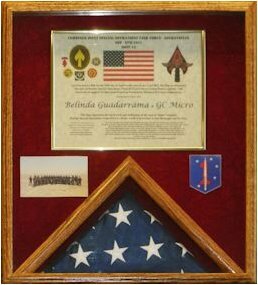 In recognition of our continued support to U.S. service members, Alpha Company Marine Special Operations Team 8112 presented CEO Belinda Guadarrama & GC Micro with the flag that accompanied them on their mission in Afghanistan. PETALUMA, CA--(Marketwired - Apr 6, 2016) - GC Micro Corporation, a hardware and software integration and services company based in Petaluma, Calif., has been announced as a subcontractor to Boeing as part of the U.S. Defense Security Cooperation Agency's sale of nine Boeing-made P-8A Poseidon aircraft to the United Kingdom. The sale of the aircraft, which is designed for maritime patrol and long-range anti-submarine warfare, has been approved by the U.S. State Department. It is expected to approve in Congress, and amounts to an estimated $3.2 billion. Boeing, the prime contractor, will work with GC Micro among other subcontractors, to deliver multiple high-performance aircraft with advanced intelligence and surveillance systems. "GC Micro is proud to be part of the Boeing team that builds American defense systems. Meeting Boeing's high performance standards and customer expectations -- and earning its Performance Excellence Award seven times -- is a testament to our commitment to excellence and outstanding customer focus," said Belinda Guadarrama, CEO of GC Micro. "We are excited to continue expanding our relationships by working with our customers to support these critical, high-value international contracts, including this contract in the UK." GC Micro continues to expand its value to customers and keeping with the aerospace industry's highest quality standards, the firm is AS9120 and ISO 9001 certified. GC Micro, which has been supporting IT procurement with Boeing for more than 20 years, has a team of specialists dedicated to delivering Boeing's IT needs at both the contract and program level. As a subcontractor to Boeing, this further exemplifies GC Micro's expertise and commitment to delivering quality services in IT hardware and software for the aerospace and defense industry. 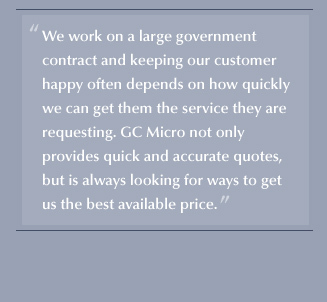 GC Micro provides computer hardware and software, such as integrated computer systems and servers, custom cable assemblies, tools/equipment for repair and overhaul, as well as facilitating and managing custom requirements for services and products such as test equipment, equipment services, maintenance and contracting services. Philanthropy is our strongest investment. On November 11, 2016, GC Micro received certification into the Woman-Owned Small Business (WOSB) Federal Contracting Program. This program was implemented in February 2011 with the goal of expanding the number of industries where WOSB were able to compete for business with the federal government. WOSB operates under the SBA (Small Business Administration). © GC Micro 2017 All Rights Reserved.